Bags checked online will cost $23 for the first and $32 for the second on United Airlines. 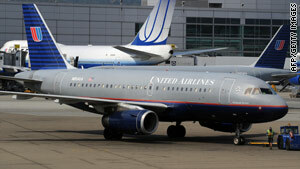 (CNN) -- United Airlines is the latest in a string of major airlines to increase checked luggage fees. Effective Thursday for tickets purchased for travel on or after January 21, passengers will be charged $25 for the first checked bag and $35 for the second at the airport. Bags checked online will cost $23 for the first and $32 for the second. United confirmed it is matching hikes last week by Delta Air Lines and Continental Airlines, said spokeswoman Sarah Massier in an e-mail. The new Delta rates went into effect Tuesday and apply to tickets purchased on or after January 5. Passengers who bought tickets before that date will pay the old rates, Delta spokeswoman Susan Elliott said. Continental matched Delta's updated fees last week, spokeswoman Mary Clark said. The increase on Continental applies to passengers who purchased tickets on or after January 9 for travel on or after January 16. Some passengers -- such as first-class fliers, some frequent fliers and military personnel on deployment -- are exempt from most checked-luggage fees. US Airways raised its fees in August to $25 for the first checked bag and $35 for the second bag when checked in at the airport. Online, the airline charges $20 and $30 for the first and second bags, respectively. US Airways is still evaluating the latest round of increases and has not made a decision yet about whether to change its checked luggage rates, said spokeswoman Liz Landau. American Airlines has not raised its baggage fees in the latest wave of increases, said spokesman Tim Smith. "Our checked bag charges remain the same at this time," Smith said. The carrier is studying the increases by other airlines, he said. American charges $20 for the first checked bag and $30 for the second bag, both online and at the airport. On discount carrier Southwest Airlines, the first and second checked bags are free. JetBlue offers a free first checked bag and charges $30 for the second.